No fishing can seem as adventurous as ice fishing can. 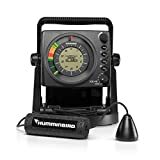 So for all the ice fishers out there, you have some really great news from the Humminbird as they designed such devices that can be your partner in crime. And you can guess it really well that we are talking about nothing but a fish flasher that is just great for ice fishing. Among all of their ice series, we have thought to provide you with Humminbird ice 45 review. It has some great features that will not only help you fish but will give all the detail that’s going on under the ice. So we thought how about we deconstruct those features and clear all the fog regarding the device with our humminbird ice 45 review. Let’s just start the Humminbird ice 45 review with the most important organ of the device: The TRANSDUCER. The ICE 45 has got a selectable dual transducer. But to work it out, you will need to submerge the transducer completely before you start the game. The transducer will convert electrical pulses to sound energy once you place it underneath the water allowing the device to understand what’s going on down there. However, it contains 9 to 19 degrees of accuracy so that it can show you the results up to 200 feet depth. If you opt for 19 degree, it will create a really wide cone at 455 kHz frequency so you can get to see the fish further around you. But if you go for 9 degree, it will create a skinner cone at 240 kHz and will provide more detail view of the fish underneath you. Moreover, it also can scan the depth scale to the sides and underneath of the boat depending on the setting you pick for the sonar waves frequency. This is another reason that got us to go for humminbird ice 45 review. The ice 45 has got a 3 color fiber optic display that comes with a 526 segment. The 3 color pallets let you show the fish right below the icy slush. Besides, the unit features trusted flasher technology that let you detect the fish roaming underneath you. Additionally, another attraction of the unit is its 2 times zooming ability. Hence you can adjust the zoom so you can see the water column with precise detail. So no matter if the fish is small or big, it will definitely provide you the details. Thus, once you understand the language of ice flasher feature you will find it a great benefit. 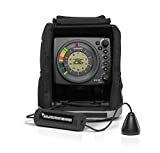 To add more, it also features extreme-temperature LCD technology that provides you all the information with finding and reporting the lake bottom. It shows you the depth all the way around and it changes automatically as you go into different depths of water. Not only that, it also lets you see the size of the cone down there no matter what degree you pick. And yes, if you want you can go for fishing at night at you will find the display completely backlit so you can read the information at any lighting condition you want. The Ice 45 features a charging power lead and you can plug into most power points. It’s a powerful device that tends to output with 800 watts. So it ensures that the transducer can pick up more details with more clarity. However, you will get 7 amp hour battery with an indicator on the device that helps you see how much power is left. Not only that, you will also get a charger so you can plug it in to charge before the battery runs out. It has great sonar ability. 3 color fiberoptic flasher technology. Easy to read automatic depth scale. You will get a battery indicator and a charger. It has a backlit so you can read the detail under any lighting condition. 7 automatically adjustable depth scales with zoom options. Depth reading up to 200 feet. LCD provides an accurate reading. You might find it really noisy when you run the device. You will not get a bag or protective case with the product to carry it. The device might misinterpret a bottom with a fish or might happen the opposite. On auto mode, it might jump up and down for the depth and this might annoy you. Q: How small of a lure will it show on the flasher screen? A: It tends to show almost any size. You might need to tweak the gain setting a bit. Yet you will not have any issue with small lures or jigs. Q: Does it show a lure one inch in length? A: It completely depends on what the lure is made of and its geometry. However, you need to set the gain. Q: Does this flasher include the dual beam transducer? A: Yes, you will get a transducer with the product. Q: Will you get a protective case with the product? A: No, you will not get a protective case for the product. Q: Is the display backlit? A: Yes, the display is backlit, hence you can read the detail during the day and at night as well. Q: Can you use Ice Flasher on a boat in the open water? A: The sonar algorithms which have been written for the products forbids the use in open water on a moving boat. 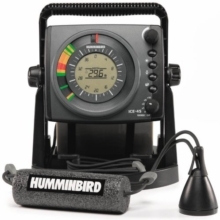 Humminbird has been one of the most preferred brands among the fishers. While some of their products got discontinued, some have come out to put a new light in fishing. As for ice fishing, well it is really not an easy task with ordinary fish finder device. So you need a different device to do the job and this flasher is the perfect answer to your question. And as we have tried to explore the products with humminbird ice 45 review, we hope it will help you know about the device more clearly.